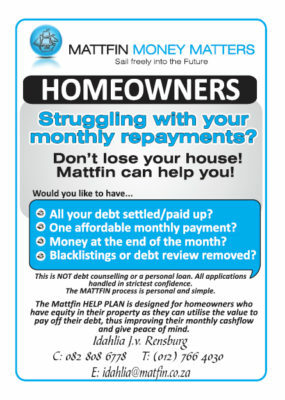 Mattfin Home Owner Debt Consolidation. Are you struggling to make it to the end of the month? Debt consolidation is one of the safest and most cost effective methods to move towards financial freedom. If money worries are affecting your quality of life as home owner, Mattfin Money Matters can help you to achieve financial peace of mind. Mattfin Home Owner Debt Consolidation. We assist employed, indebted home owners to overcome their debt and achieve full credit worthiness by using the available value in their property. Mattfin will be able to use the equity in your property to settle all debt and restore your credit health. We will pay your creditors and settle the full amount immediately. And you will only repay one loan, giving you savings on your monthly debt repayments. Once all debt has been settled, you will have a healthy credit profile. Mattfin Money Matters Home Owner Debt Consolidation – Do you meet the following Criteria? Owning property with a minimum value of R 300 000. Are in default on credit bureaus, over extended, have poor credit record or judgments against them. Stable job, currently employed with a minimum salary of R 8 500. Between ages of 21 and 55 years.